Lakeridge Winery & Vineyards is excited to announce its latest retail partnership with Costco Wholesale clubs throughout the Orlando Area. Lakeridge wines are currently available in Costco’s Winter Park location and the Altamonte Springs club will have them available by May 31st. Both Costco clubs invite you to meet Jeanne Burgess, Lakeridge Winery’s Winemaker for the part 26 years. She will be on site for a meet and greet and bottle signing event in the Winter Park store May 10 & 17, and in Altamonte Springs June 7 & 14. 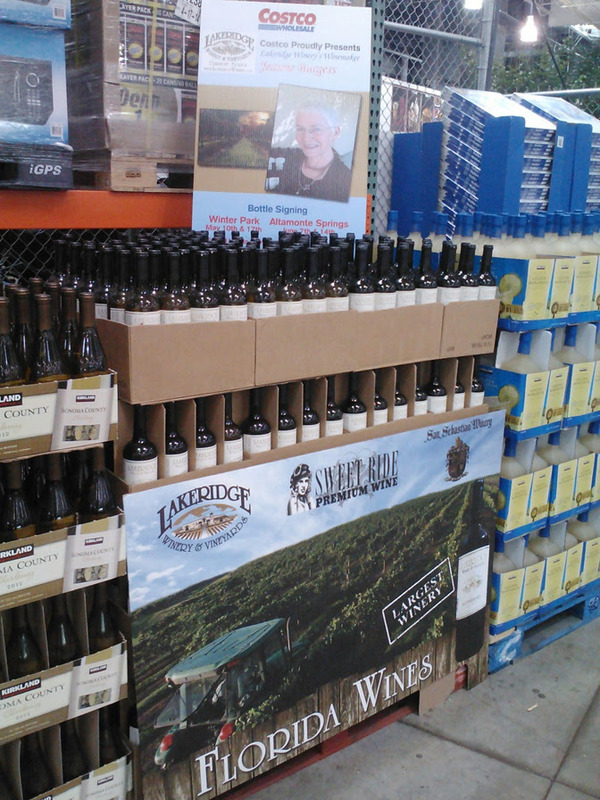 Be on the lookout for more of your favorite Lakeridge Wines available in the Costco nearest you soon! Seavin, Inc., owner of Lakeridge Winery & Vineyards in Clermont, FL, San Sebastian Winery in St. Augustine, FL, Prosperity Vineyards in Prosperity, FL, and the Sweet Ride Wine Company is a pioneer in the development of table, dessert, and sparkling wines made from Muscadine and hybrid grapes. Lakeridge Winery & Vineyards is Florida’s Largest Premium Winery and San Sebastian Winery is the second largest. Together the brands have won over 1,222 awards for excellence in winemaking. Complimentary tours and wine tasting are offered seven days a week at both the Clermont and St. Augustine locations. Seavin, Inc., Dedicated To Your Good Taste. Please click here to view more information about Seavin, Inc.
August 20, 2014 Wine, Fashion and Dessert = Sweet Charity!